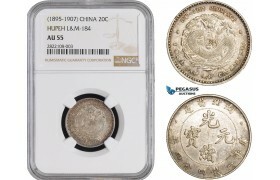 AA650, China, Hupeh, 10 Cash 1906, 1 Peak Cloud, Swirl in Relief, NGC MS64BN ..
AA651, China, Fengtien, 20 Cents 1904 (8 Rows of scalles) Silver, L&M 485, NGC AU58 ..
AA652, China, Kiangnan, 20 Cents 1901, Silver, L&M 238, NGC MS63 ..
AA653, China, 10 Cash 1912, 2 Circles, 7 Dot Rosettes, Common Flower, NGC MS65BN, Pop 1/0 ..
AA654, China, "Fat Man" 20 Cents Yr. 3 (1914) Silver, L&M 65, NGC MS62 ..
AA803, China, Szechuan, 50 Cash Yr. 1 (1912) KM449.1a, AU-UNC, some hairlines ..
AA839, Great Britain, Trade Dollar 1899-B, Bombay, Silver, NGC UNC Det. 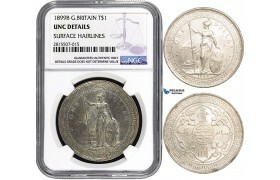 AA839, Great Britain, Trade Dollar 1899-B, Bombay, Silver, NGC UNC Det. 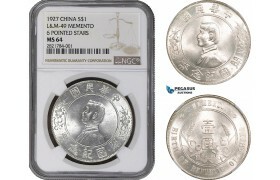 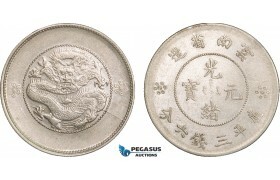 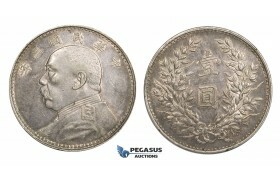 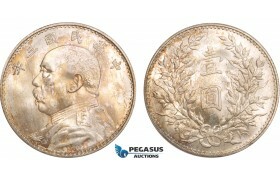 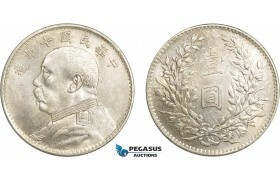 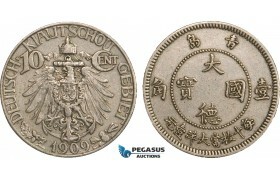 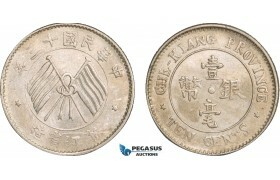 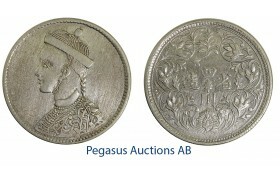 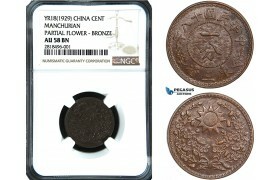 ..
AA897, China, Memento 20 Cents 1912, Silver, L&M 61, NGC AU58 ..
AA927, China, Kirin, 5 Cents 1906, Silver, L&M 566, NGC F15 ..
AA928, China, Chekiang, 10 Cents ND (1898-99) Silver, L&M 285, NGC VF30 ..
AA963, China, 10 Cents 1926 (Pu Yi Wedding) Silver, L&M 83, Dragon & Phoenix, Toned VF-XF ..
AB014, China Kiangnan, Dollar 1904, Silver, L&M 257 HAH CH, NGC AU Det. 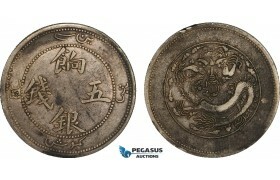 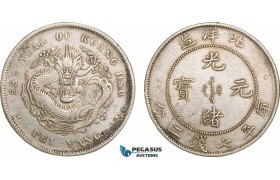 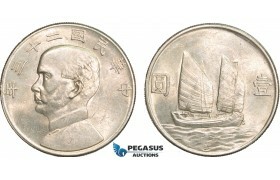 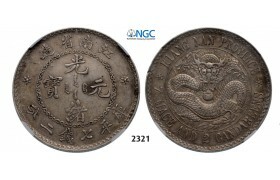 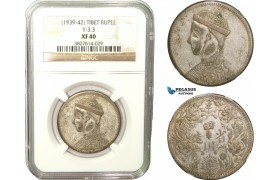 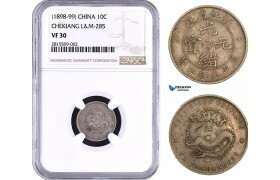 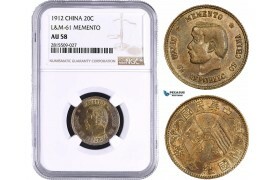 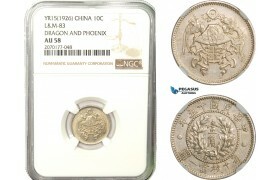 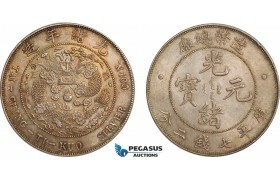 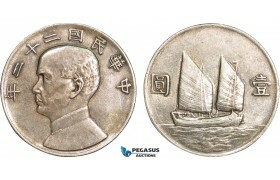 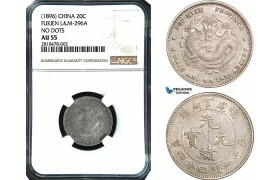 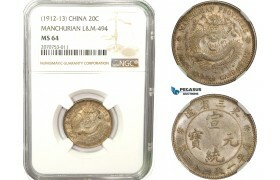 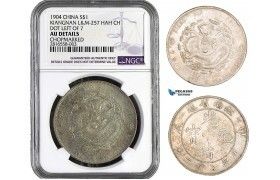 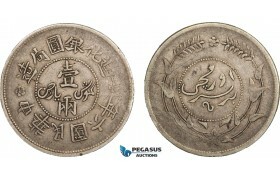 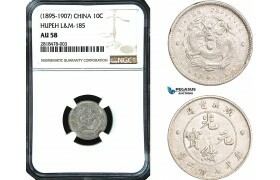 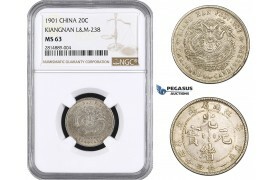 "Chopmark"
AB014, China Kiangnan, Dollar 1904, Silver, L&M 257 HAH CH, NGC AU Det. 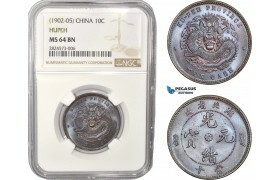 "Chopmark" ..
AB015, China, 10 Cash 1912, 1 Circle - 2 Dot Legend, Simple Flower, NGC MS64RB, Pop 3/1 ..
AB075, China, Chekiang, 10 Cents 1924, Silver, L&M 289, Cleaned AU-UNC ..
AB076,China, Chihli, 7 Mace 2 Candareens (Dollar) Year 29 (1903) Tientsin, Silver, L&M 462, Clea..
AB077, China, Hupeh, 10 Cash ND (1902-05) Y-122, AU ..
AB078, China, Kiangnan, 1 Cash 1908, Long Stroke "Ning" Y-7K, AU ..
AB079, China, Kiangsi, 10 Cash 1912, Y-412a2, VF-XF ..
AB080, China, Kwangtung, 1 Cash ND (1890-1908) Brass, Brilliant UNC ..
AB081, China, Shansi, 10 Cash ND (1851-61) Cast Brass, C# 21-5, aVF ..
AB082, China, Sinkiang, 5 Miscals ND (1905) Silver, Y6.1, Dark toning, aVF ..
AB083, China, Sinkiang, 1 Sar ND (1917) Silver, Y45, Dark toning, aVF ..
AB084, China, Yunnan, 3 Mace 6 Candareens (50 Cents) 1907, Silver, L&M 419, Dark Toning, VF-XF ..
AB085, China, Yunnan, 3 Mace 6 Candareens (50 Cents) 1911, Silver, L&M 424, Cleaned AU ..
AB087, China, 1 Dollar Yr. 3 (1911) Silver, L&M 37 (No Period) Cleaned XF ..
AB088, China, Dollar Yr. 22 (1933) Silver, L&M 109, Toned AU ..
AB100, China, Kiau Chau (German Colony) 10 Cents 1909, aXF ..
AB158, China, Kiangsoo, 10 Cash 1902 (Error date on Slab) Y-162.4, NGC MS61BN ..
AB159, China, "Fat man" 10 Cents Yr. 3 (1914) Silver, L&M 66, NGC AU58 ..
AB258, China, Manchurian Provinces, 20 Cents ND (1912-13) Silver, L&M 494, NGC MS64 ..
AB259, China, Tibet, Rupee ND (1939-42) Silver, Y-3.3, NGC XF40 ..
AB260, China, 10 Cents 1926 (Pu Yi Wedding) Silver, L&M 83, Dragon & Phoenix, NGC AU58 ..
AB294, China, Hupeh, 10 Cash ND (1902-05) Y-122, NGC MS64BN ..
AB381, China "Junk" Dollar Year 23 (1934) Silver, L&M 110, Lustrous AU ..
AB403, China, Kwangtung, 10 Cents Year 3 (1914) Silver, Toned UNC (Spots) ..
AB404, China, Empire, 7 Mace 2 Candareens (Dollar) No Date (1908) Tientsin, Silver, Toned UNC ..
AB405, China, "Fat man" Dollar Yr. 3 (1914) Silver, Toned Ch Br. 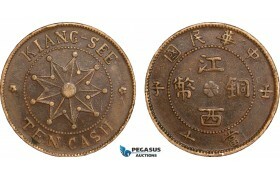 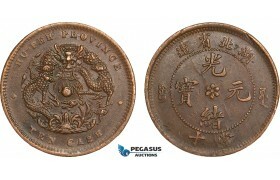 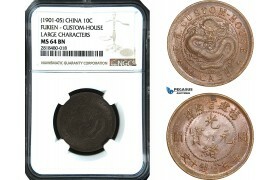 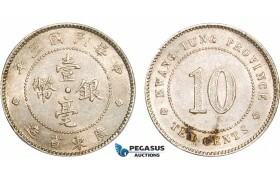 UNC ..
AB433, China, Fengtien, 10 Cash 1904, Brass, NGC XF40 ..
AB434, China, Fukien, "Custom House" 10 Cash ND (1901-05) Large Characters, NGC MS64BN ..
AB435, China, Fukien, 20 Cents 1896, Silver, L&M 296A No dots, NGC AU55 ..
AB436, China, Hupeh, 10 Cents ND (1895-1907) Silver, NGC AU58 ..
AB437, China, Kiangnan, 1 Cash 1908, Long Stroke "Ning" Y-7K, NGC UNC Det. 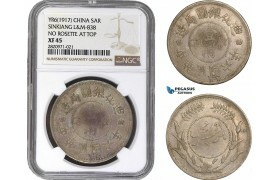 AB437, China, Kiangnan, 1 Cash 1908, Long Stroke "Ning" Y-7K, NGC UNC Det. 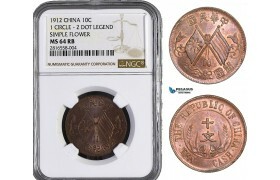 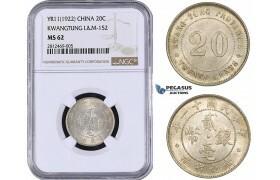 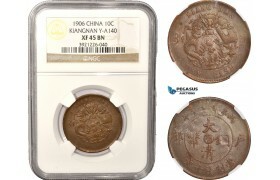 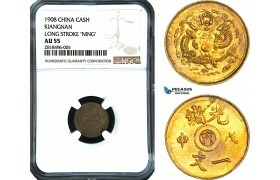 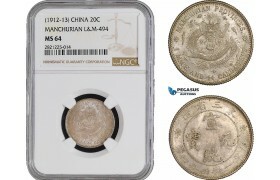 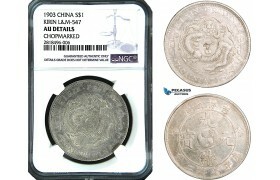 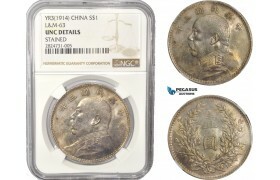 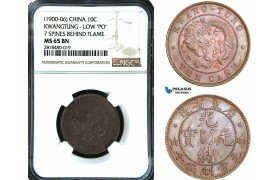 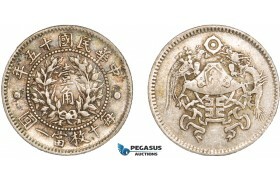 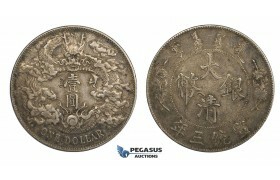 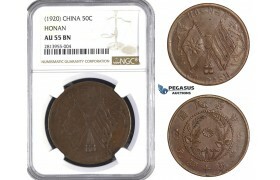 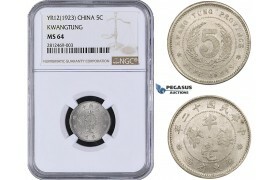 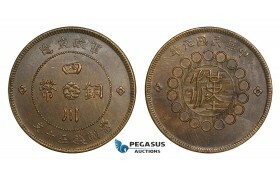 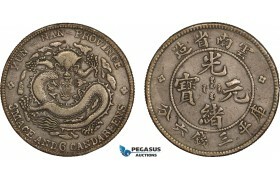 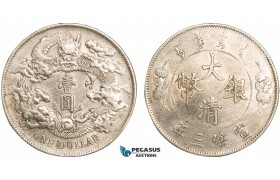 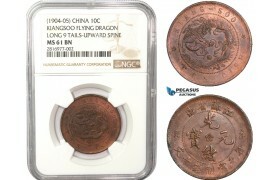 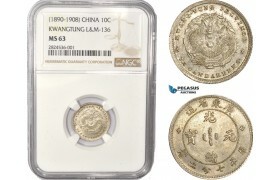 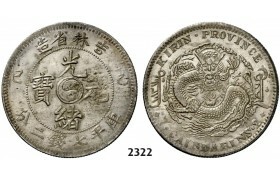 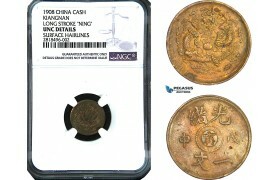 ..
AB438, China, Kiangnan, 1 Cash 1908, Long Stroke "Ning" Y-7K, NGC MS62 ..
AB439, China, Kiangnan, 1 Cash 1908, Long Stroke "Ning" Y-7K, NGC AU55 ..
AB440, China, Kiangnan, 1 Cash 1908, Long Stroke "Ning" Y-7K, NGC AU55 ..
AB441, China, Kirin, 7 Mace 2 Candareens (Dollar) 1903, Silver, L&M 547, NGC AU Details "Chopmark"
AB441, China, Kirin, 7 Mace 2 Candareens (Dollar) 1903, Silver, L&M 547, NGC AU Details "Ch..
AB442, China, Kwangtung, 10 Cash ND (1900-06) Low "PO" 7 Spines behind Flame, NGC MS65BN, ..
AB443, China, Manchurian, Cent Yr. 18 (1929) NGC AU58BN ..
AB666, China, Chekiang, 10 Cash ND (1903-06) "2 Characters" NGC MS63BN ..
AB667, China, Hunan, 10 Cash 1906, Large mint mark, tooth like fireball, NGC XF45BN ..
AB769, China, Hupoo, 20 Cash ND (1903-17) Empire Standard Dragon, NGC MS64BN ..
AB770, China, Kiangnan, 10 Cash 1902, Y-135, Reeded Edge, NGC MS65BN ..
AB855, China, Fukien, 10 Cash ND (1901-05) Custom-House Large Characters, NGC MS63BN ..
AB856, China, Hunan, 10 Cash ND (1902-06) Seated Dragon, NGC MS63RB ..
AB857, China, Hupeh, 10 Cash ND (1902-05) Water Dragon, Medium "Bei" LG Letters, NGC MS64B..
AB858, China, Kiangsu, 10 Cash 1905, NGC MS64RB ..
AB859, China, Chingkiang, 10 Cash 1906, Flying Dragon, Med. 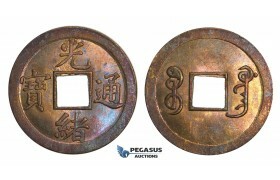 Circle-Inv. 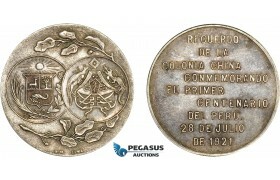 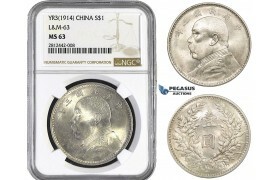 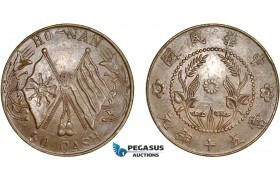 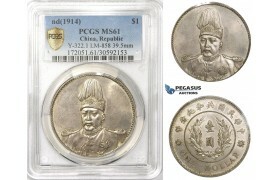 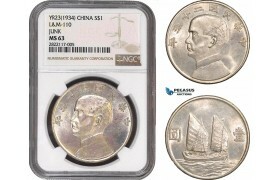 3 Cloud, NGC MS64RB ..
AB860, China, Manchurian, 20 Cents ND (1912-13) Silver, L&M 494, NGC MS64 ..
AB861, China, Sinkiang, Sar Yr 6 (1917) L&M 838 No rosette at top, Tihwa, Silver, NGC XF45 ..
AB862, China, "Fat man" Dollar Yr. 3 (1914) Silver, L&M 63, NGC MS62 ..
AB863, China, "Fat man" Dollar Yr. 9 (1920) Silver, L&M 77, NGC MS63 ..
AB864, China "Junk" Dollar Yr. 22 (1933) Silver, L&M 109, NGC MS63 ..
AB964-R, China, Panda 1/20 oz. 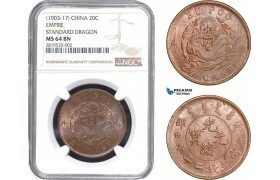 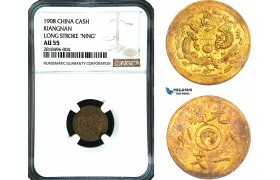 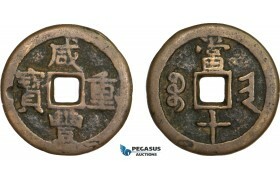 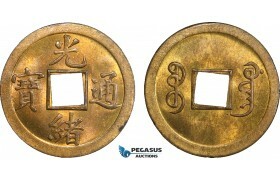 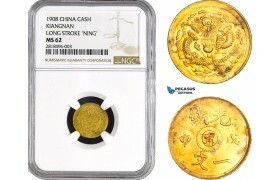 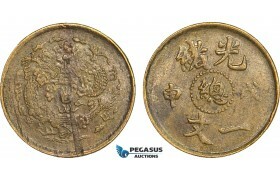 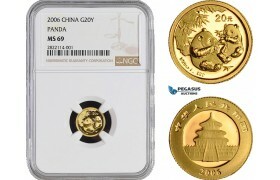 20 Yuan 2006, Gold, NGC MS69 ..
AC037, China, Hupoo, 20 Cash ND (1903-17) Empire Standard Dragon, NGC MS61BN ..
AC038, China, Kiangnan, 10 Cash 1906, Y# A140, NGC XF45BN ..
AC039, China "Memento" Dollar 1927, Silver, NGC MS64 ..
AC040, China "Junk" Dollar Yr. 23 (1934) Silver, NGC MS63 ..
AC220, China, Hupeh, 20 Cents ND (1895-1907) Silver, L&M-184, NGC AU55 ..
AC221, China, "Fat man" 10 Cents Yr. 3 (1914) Silver, L&M-66, NGC MS62 ..
AC275, China, Hunan, 10 Cash 1906, Y-10h.4, NGC AU53BN ..
AC276, China, Hunan, 10 Cash 1906, Y-112.10, NGC XF40BN ..
AC340, China, Hupeh, 10 Cash ND (1902-05) NGC MS64BN ..
AC341, China, Kirin, 10 Cash 1903 "Cashes" NGC AU53BN ..
AC342, China, Kwangtung, 10 Cents ND (1890-1908) Silver, L&M-136, NGC MS63 ..
AC343. 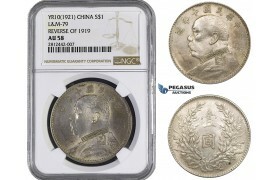 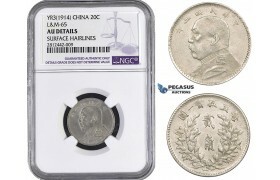 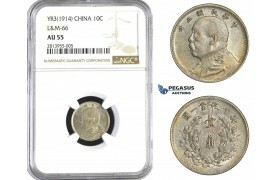 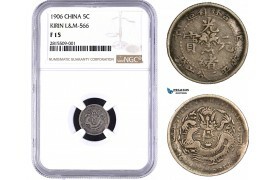 China, 10 Cash 1920, Incuse Star-LG Characters, Small Rosettes, NGC MS64BN ..
AC344, China "Fat Man" 10 Cents Yr. 3 (1914) Silver, L&M-66, NGC AU58 ..
AC345, China "Fat Man" Dollar Yr. 3 (1914) Silver, L&M-63, NGC UNC Det. 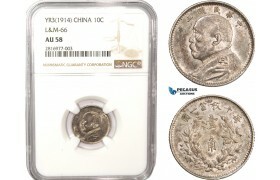 AC345, China "Fat Man" Dollar Yr. 3 (1914) Silver, L&M-63, NGC UNC Det. 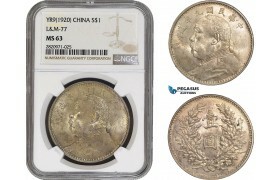 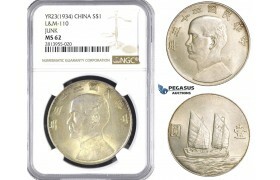 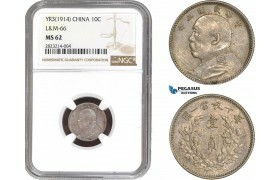 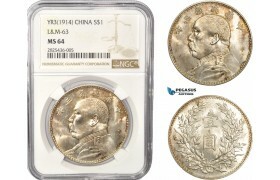 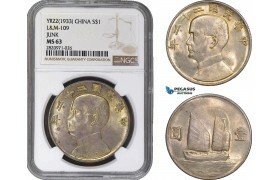 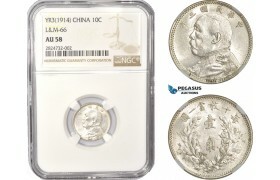 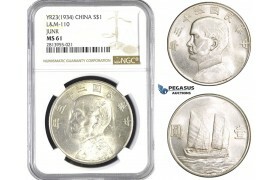 ..
AC346, China "Fat Man" Dollar Yr. 3 (1914) Silver, L&M-63, NGC MS64 ..
AC617, China, Honan, 50 Cash ND (1920) AU-UNC (Few scratches) ..
AC618, China "Fat man" Dollar Yr. 10 (1921) Silver, L&M 79, Cleaned AU ..
AC670, China, Hupoo, 20 Cash ND (1903-17) NGC AU55BN ..